What difference would it make to your business if someone with the qualifications and experience could take the time to look, listen and advise. 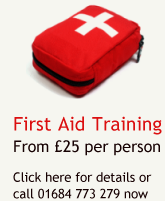 Do you worry about whether your business is complying with Health and Safety, Fire, or First Aid Training Legislation. Has a visit from a local authority enforcement officer resulted in a list of actions. Do you find it difficult to keep on top of legal requirements or staff training. Are all of your staff trained correctly. Have you ever thought about these issues, are you concerned, worried about the cost, worried about what you may be sold. If you want to benefit from our experience and knowledge, we are here to help.